This sister bar of New Gold Mountain may be hard to find it's all too easy to walk straight past the discreet entrance - but it's well worth seeking out. This sister bar of New Gold Mountain may be hard to find it’s all too easy to walk straight past the discreet entrance – but it’s well worth seeking out. 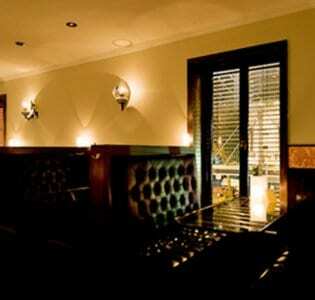 A tiny hole-in-the-wall bar, it’s an intimate and atmospheric space with Chinese themed décor. The walls are covered in communist propaganda posters and the room is dotted with Mao statues. The overall effect is kind of kitsch but it works. Cocktails boast tongue-in-cheek names such as the Great Leap Forward and Dictatorship of the Proletariat, the former a vibrant mix of lychee vodka, mint, lime and ginger. Their chilli martini is also well worth trying, but it’s the espresso version, reputed to be the best in the city, that’s become their signature must-try drink. Bar snacks are oriental in influence too, steamed dumplings and the like, and they do a nice line in bubble teas and Asian beers as well. 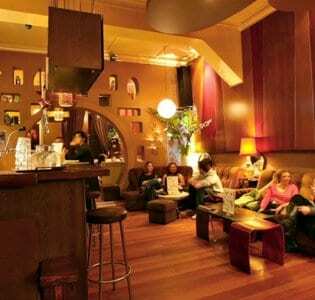 A café by day (these guys takes their coffee as seriously as their cocktails), the atmosphere is hip and stylish yet pleasingly free of attitude and the bar makes the perfect place to kick off your night with a cocktail or two. The open fire makes it particularly cosy on winter nights and the drinks will also help to keep you warm, especially that espresso martini.